In October last year, a Massachusetts newspaper reported strange noises coming from a local dairy farm. The noises carried out through the entire night and into the small hours of the morning. Residents, who described the low and harrowing wails as 'spooky' and 'scary' were prompted to call the local police, who, after investigating the noise, quickly determined its cause. The noises were coming from the resident dairy cows who had just become new mothers. Their newborn calves had been taken to slaughter shortly after their births to stop them from consuming any milk. The mother cows were wailing through the night over the painful separation from their babies. The next day, due to the influx of concern from local residents, the local police issued a short statement on its Facebook page to reassure the locals, 'We’ve been informed that the cows are not in distress and the noises are a normal part of farming practices'. So while this part of the Massachusetts police’s statement was true, there is something deeply troubling about the next part of it; a fallacy which is so perpetually drummed into our consciousness that we either refuse to acknowledge it or choose to conveniently ignore it. The fallacy is conveyed in six short and dismissive words: 'The cows are not in distress'. It’s a peculiar thing when we reserve moral consideration to some but not to others. This is especially true when our reasons for doing so are very murky. The incredible contradiction we live with in our society today is that while we declare our love and appreciation for some animals, human cruelty to the less fortunate of species takes place on an extraordinarily vast and industrial scale. As humans, we have come to realise the importance of extending moral consideration to other animals. In a society that places our own species as dominant over all others, we have set up legalisation, regulatory bodies and advisory groups to protect the welfare of other animals. We prosecute people who throw cats over bridges, assemble specialised task forces to take down the underground world of dogfighting and impose sanctions, together with other nations, in a bid to stop whaling. But for animals raised to end up on our dinner plates, we apply a very different standard for the sake of justifying our food palette. To be born a Labrador or Golden Retriever is to be loved, adored and cared for over a long and comfortable life. But to be born a pig, more intelligent and highly sensitive to the physical and emotional trauma imposed by modern farming practices, is to endure a short and miserable lifetime of abuse, terror and neglect. Today the use of industrial methods to kill food animals on a massive scale is standard procedure. Animals are routinely (and legally) forcibly impregnated, castrated, and have their horns and tails cut off without anaesthesia. Sows are crammed into crates where they are unable to move, hens are debeaked without pain relief (leaving many to die from shock), and female cows are milked until they become too weak to stand, at which point they are promptly trucked off to be killed. And finally, like the ill–fated bobby calves who become liabilities to the dairy industry, baby chicks who suffer the terrible misfortune of being born male in the egg industry are ground up alive within the first few hours of their birth, simply because they do not have the profitable ability to produce eggs. When we think about what is essentially wrong with all of this, what it comes down to is sentience, primarily the capacity for suffering. In 1789 Jeremy Bentham famously wrote, 'The question is not, can they reason, nor, can they talk but, can they suffer?' But while most of us agree that animals do experience pain, fear and distress, we’ve come to master the skill of switching off our empathy when told something like, 'Don’t worry, there’s no abuse happening here. This is all part of the routine'. The dominant meat–eating culture in which we live successfully condemns all of us to suffer from the same moral paradox. When we think about it, we know that food animals are individuals, but we’d rather not know it. We feel compelled to speak up when confronted with images of animals being abused, yet we actively sustain an industry that bases its very growth and success on the lifelong abuse of animals. When we see the dismembered parts of animals on our supermarket shelves or on our dinner tables, we instinctively perceive them as things. This allows us to justify animal abuse in all sorts of feeble ways that remain remarkably inconsistent with our usual line of moral reasoning. The moral cost of our cognitive dissonance is significant. Factory farming animals, like other oppressive and violent regimes which counter regular human values, depend on a set of psychological defence mechanisms that encourages others to justify and sustain it. These mechanisms enable us to support wide scale and unnecessary violence towards other feeling beings, without the moral discomfort we would normally feel. They enable us to support an oppressive system that we would otherwise oppose, and are enforced by a range of fallacies and public deception. For example, before the American Civil War, slaves were described as not having the capacity to love their children, which made it easier for people to justify separating them. In Ancient Greece, Hippocrates used the term ‘hysteria’ to account for emotional instability and mental illness in women – a diagnosis that survived up until the mid–19th century with the first sparks of the women’s suffrage movement. In Nazi Germany, a recurrent theme in anti–Semitic propaganda was that Jews spread diseases, which stopped non–Jews from entering the ghettos and witnessing the horrific conditions inside. In the case of food animals, we are told that they cannot think, suffer or feel pain. That animals are not intelligent enough, or do not hold enough self–awareness, to understand what’s going on around them. Members of the public are not allowed to see inside factory farms or slaughterhouses because it poses serious 'health risks' and 'startles' the livestock. Those who film or photograph the inside of a slaughterhouse, even if standing on public property, can be liable to face jail time, pay hefty penalties and even be charged under terrorism laws. It is difficult to believe that when we demean and abuse other animals, that our humanity does not suffer also. It is even less difficult to believe that when we allow room for cognitive dissonance, especially when it comes to wide scale suffering at our own hands, that the very scaffolding of our ethical framework as a society does not fall victim to it. The great moral cost is not about animal rights or animal welfare, but of human responsibility, because in our relationship with other animals, our choices hold heavy life and death consequences for other sentient beings. The least we can do in the pursuit of moral progress is to allow food animals a certain degree of our moral consideration before our next meal. Valerie Wangnet is a full time copywriter who also runs a not-for-profit organisation that provides school curriculum resources to encourage children to think ethically. Volunteer work with animal welfare groups gave her insights into animal food production as well as a passion to change attitudes to the relationship between humans and other animals. This essay is the third prize winner in the 2014 Margaret Dooley Award for Young Writers. Beautifully written Valerie, I hope this gets people to ask themselves some questions about what they support when buying those "things" wrapped in plastic at the supermarket. People who honestly believe animals don't feel pain or that it is acceptable for animals to be subjected to the living standards in intensive farming practice have totally lost contact with their humane and ethical sides. But then again that's why they don't want you to see in a factory farm, they want to keep the plastic wrapped slab of flesh separate from the animal suffering constantly in the name of faster and cheaper and larger scale production. I would like us to end all meat production, but for the life of me I cant understand why in this era of free and easily accessible information the majority of people in this country would want these practices to continue... or simply don't care enough to look at or consider them. Thank you for writing this Valerie! An interesting ethical challenge for the majority of us who eat meat, eggs, milk, and food products containing them. I don't wish to argue that we should be vegans, because the human species is generally omnivorous and has been so for millennia; it is part of our human nature. Hunting and killing an animal in the wild is a direct involvement of the predator human and the hunted animal. The ethical imperative is to kill humanely and respect the animal killed to be eaten. However the cruelty involved in the industrial breeding and raising of animals, birds and fish for human consumption, so clearly described in this essay, cannot be accommodated in terms of a one to one ethical relationship. Given that cruelty appears to be inherent in the industrial scale of the process, the first ethical demand is to acknowledge that cruelty. Valerie's essay challenges each of us by emphasising the cruelty imposed even without any actual process of killing. Congratulations, Valerie. These stories of cruelty to animals need to be stated and restated. I chose to be vegetarian when I realised what meat-eating entailed and vegan when I read how much pus is allowed per measure of milk (in other words, dairy cows suffer from mastitis). Now I will only eat dairy foods from farms where I know the animals are well-cared for, not stressed and kept healthy. In the main, that means I buy from biodynamic sources. I am glad John Kersh's Brendan and Sally treat their animals well and hope the farmers to whom animals are onsold follow suite. Man's inhumane treatment of animals is unlikely to improve while large numbers of men, and (increasingly) women, are eagerly seeking to join organisations committed to fighting, terrorising, and killing other human beings, just because they are 'different'. John, Being part of the agricultural community, you demonstrate surprising ignorance about the industry. Factory farming or the intensive breeding of beef cattle, meat broilers, layers and pigs, churns out substantial profits for farmers without a whit of care for the wellbeing of the animals. I think you are confusing alive animals with animals who have their mental and physical health optimised. You should take a closer look at the dairy industry next time you visit your farmer friends and check the mastitis rate and antibiotic use amongst the herd. Also the non-agricultural community are not ignorant about the much publicised problems in the dairy industry like bobby calves who are removed immediately after birth(so no suckling there) and then within a week, trucked to saleyards and slaughterhouses with a legal time off feed of 30hrs (these are newborns who would feed 5 times a day normally)!!! Your comments confirm that the agricultural industry does not see a problem with their practices and will go to lengths to spread misinformation rather than address the animal welfare issues endemic to farming. What a beautiful article, Val. It is an eye opening and educational for all of us. Thank you Valerie. An interesting piece of writing that makes me reconsider my 'meal choices'. As a mother, it makes it quite difficult to consider going 'vegetarian' as I don't want my children to lose out on good sources of protein. I had a go at being vegetarian back in uni but found it impossible to continue. Maybe it is worth a try again. The massive scale of demand for animal products in the western diet has led to the development of inhumane factory farming. A shift to a more plant-based diet would not only see greater benefits, but also a more equitable distribution of food in the world. 1,2 and even 3 vegan days a week could make a major positive difference to animals, the environment and all of us. Thank you, Valerie, and well done on a great article. Thanks, Valerie, for your thought-provoking article. I come from a beef-producing farm and when I was there recently it was so heart-breaking to hear the bellows of the cows separated from their calves, which went on for a few full days and nights. The calves in this case were not being killed, simply moved to grow up separately from their parents. All the same, it is real evidence of emotions in them. I have been vegan now for a number of years and am always inspired by the commitment of younger people to awareness of the food-production process. It's simple. We shouldn't be hurting animals. Go vegan. Although I have been a vegetarian for over 80 years I am still finding the change to the more ethically logical veganism a difficult step. The spirit is willing but the flesh is weak and I obviously have very stubborn taste buds! However, I'm getting there! On the plus side, I have excellent health and it is easy and possible to have a balanced diet without meat or dairy products. The spectre of protein lack is nonsense because there are so many much better sources of protein other than those from animals. 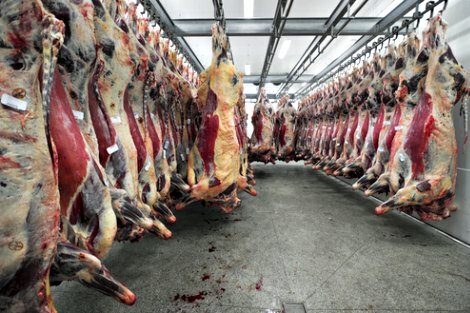 In any case, meat eating is responsible for huge damage to the planet and is unsustainable; the global livestock industry is responsible for more greenhouse gas emissions than all planes, trains and automobiles in the world combined! Thank you Valerie - I hope your article will persuade people to give up meat and embrace a plant based diet. Thank you so much for this excellent essay. I hope that one day all humans can regard non human animals with the respect and compassion that they deserve.